I am writing on behalf of the Campaign for Clean Air in London (CCAL) to submit evidence to the Environment Committee of the London Assembly (LAEC) as part of its forthcoming investigation into air quality in London. All members of the LAEC are copied on this letter. deliver a magnificent London 2012 Summer Olympics and Paralympic Games with a valuable lasting legacy. All it would take to achieve this goal is a commitment from the Prime Minister that the government will comply fully with [health based] air quality laws that is followed by determined action. Mayor Johnson too will need to play his part since, while not having [today] a legal duty to ensure limit values are achieved, he holds the key to deliver most of the solutions. Success with leaded petrol, the ozone layer and acid rain show what can be achieved if sufficient political will exists. Please take this opportunity to press for such a commitment from the Prime Minister (and others). Please back such a call with clear recommendations from the LAEC supporting the most obvious solutions (e.g. one or more additional inner low emission zones) and highlight key issues (e.g. the monitoring of ‘PM2.5’). With impetus from the LAEC and others on air quality, London could achieve major long term environmental, social and economic benefits and establish itself firmly as the world’s leading city. CCAL suggests that the LAEC’s report into air quality might be titled ‘Air quality: the health impact and how to address it before London 2012’. That would be a wonderful legacy. 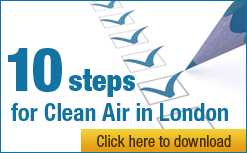 c) quality of life; and health inequalities within boroughs caused by poor air quality. 3. Sources: Who/what pollutes most in the most polluted areas (now and forecast to ensure sustainable solutions)? e) how many people are affected? e) the opportunity for the Commission for Sustainable London 2012 to act assertively. i) the cost-effectiveness of behavioural change e.g. people can protect health and save money. ‘annual’ report is for 2004. Ensuring that fine particulate matter (PM2.5) is being monitored robustly in London. The government has admitted that road transport is the cause of all the current breaches of air quality laws in the United Kingdom (UK), with diesel emissions being by far the biggest single component. The solutions involve two overlapping ‘circles’ of measures (‘The London Circles’) – one for congestion and one for emissions – that target the most polluted vehicles in the most polluted areas with technology-based solutions and create a tipping point of behavioural change backed by awareness, persuasion, incentives and regulation (when necessary). Behavioural change offers the most cost-effective solutions. In the emissions circle, we need urgently one or more additional inner low emission zones (LEZs) – at least in central, east and west London – to reduce harmful emissions. The fairest measures will involve making the ‘polluter pay’ and give people the choice of: not entering the most polluted area with the most polluting vehicle; choosing (longer) alternative routes; upgrading their vehicles; using other modes of transport; and/or paying (a fine) to continue polluting. At the margin, even the existing LEZ reduces congestion by deterring some vehicles from entering London. In the congestion circle, road pricing is essential, fair and much needed to tackle congestion which is bad now and forecast to increase significantly in coming years. The best version of this is dynamic road pricing (such as ‘tag and beacon’ or its equivalent) which CCAL understands could be introduced rapidly initially within central, east and west London. Road pricing reduces emissions and ‘makes the polluter pay’ since vehicles produce less than half as much air pollution once their speed reaches 30 kilometres per hour. In CCAL’s view, with road transport the biggest single cause of breaches of air quality laws, there is a massive opportunity for London to pursue a holistic package of measures that tackle emissions and congestion that could transform its future and that of many other large cities. For example, the rapid introduction of a combination of: one of more inner low emission zones; and dynamic road pricing (such as ‘tag and beacon’) could ensure full compliance with air quality laws and tackle the spectre of ever increasing congestion in our cities. A vision of road transport built on ‘The London Circles’ offers the opportunity to carry with it the Mayor of London, the government, all the political parties, business, community groups and non-governmental organisations. Indeed, without such a vision and such a broad range of support, it seems unlikely – without action by the courts – that the legal and other challenges facing the UK in London will be met. vii. the need for our political leaders to demonstrate, with robust follow-through, the political will needed to grasp the once in a lifetime opportunity to deliver meaningful environmental, social and economic benefits for London through air quality improvements. There is much to gain and much to do. Let us remember though that, ultimately, the risk of premature death and ‘permanent’ climate change caused by an inability to tackle air pollution, are even worse fates than economic problems. Please therefore set a bold vision for the future. London has a magnificent opportunity to enhance its reputation as the world’s leading city over the next four years as it prepares for and delivers the London 2012 Summer Olympics and Paralympic Games. More importantly still, London has the opportunity to establish meaningful air quality benefits for itself that could also show the whole world how air pollution – whether air quality or climate change – can be tackled successfully. CCAL urges the LAEC to be a catalyst in triggering this opportunity in each of the next four years. Finally, CCAL wishes to express its appreciation for all the work done by you and the LAEC to highlight London’s poor air quality and propose practical solutions to improve it.